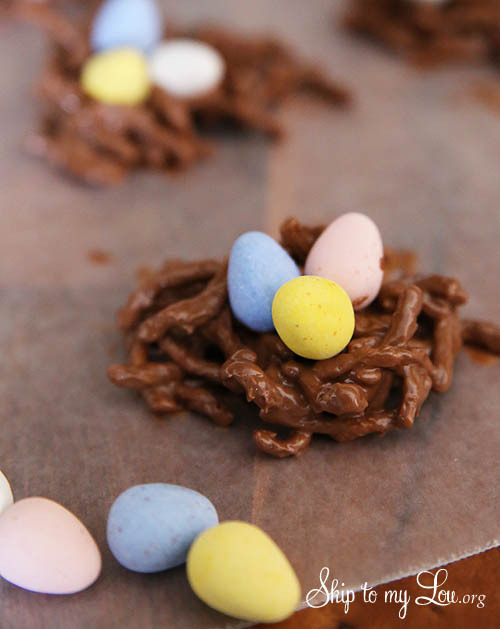 These chocolate peanut butter bird nest cookies are a fun Easter treat! 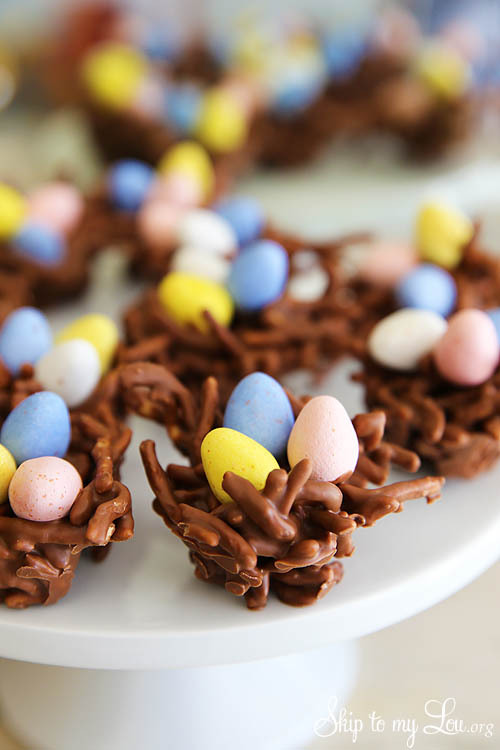 With only three ingredients and some chocolate candy coated eggs, you have a festive treat that is super yummy! There are so many fun ways to celebrate Easter. These Easter Basket Cupcakes make a darling display. You might also like these free printable bunny cupcake wrappers. Make sure you browse all the fun Easter Crafts. Oh, check out these bunny cupcakes! 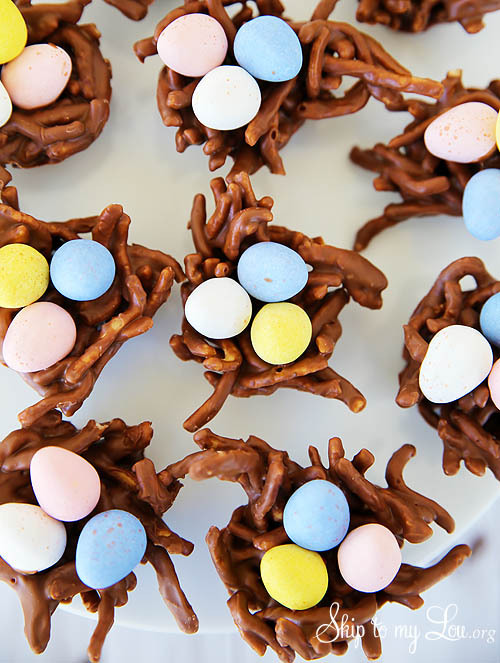 These chocolate peanut butter bird nest cookies are a fun Easter treat! 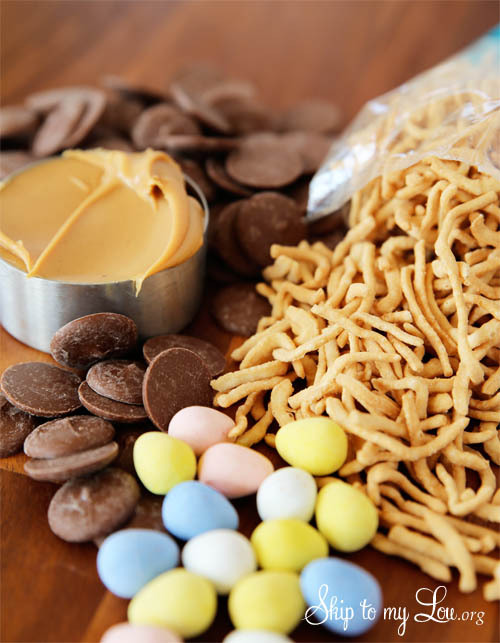 With only three ingredients and some chocolate candy coated eggs you have a festive treat that is super yummy! I also placed the mixture directly into ungreased mini muffin pans. After placing filled pans in the freezer for 10 minutes the cookies popped right out. You can get milk chocolate candy coating from my shop. 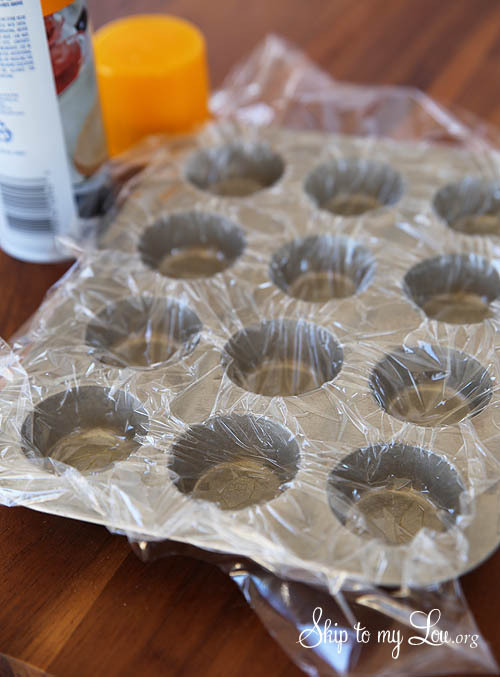 Prepare two 12 cavity mini muffin pans by lightly spraying pans with cooking spray. Lay a piece of plastic wrap over the top of each pan. Push plastic wrap into each cavity. 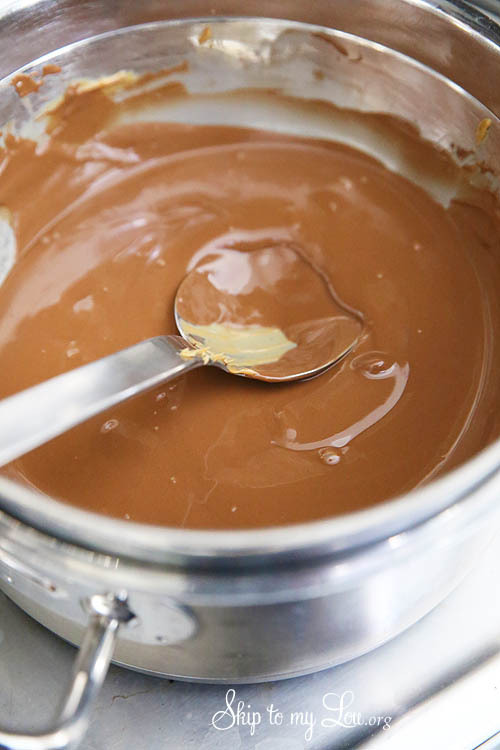 Slowly melt candy coating and peanut butter in a double boiler. Candy coating has a very low melting point so the water does not need to boil. If candy coating gets too hot it will actually thicken and harden cloudy. Take your time and candy coating will stay liquid and harden with a sheen. Gently fold in 1 package of chow mein noodles. Drop a spoonful of chocolate mixture into each cavity. Make sure the mixture fills the cavity so they stand up once you remove them from the pan. 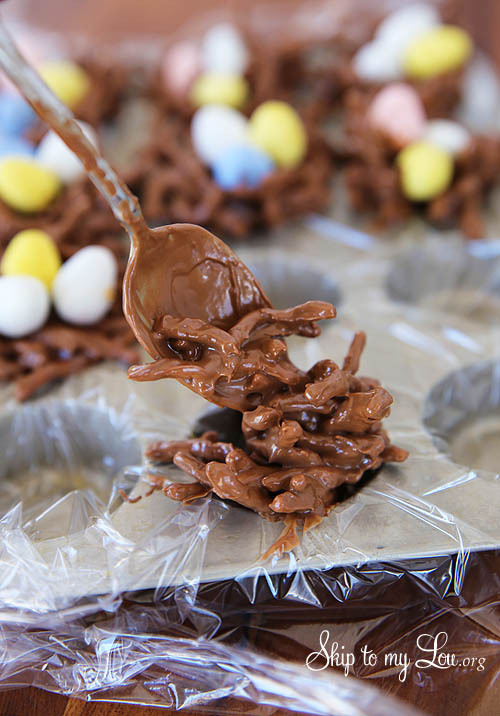 Immediately place chocolate eggs in the nest before candy coating hardens. No mini muffin pans? No worries. Drop the mixture by spoonfuls onto wax paper. Allow cookies to completely cool and harden! Enjoy! Note: I also placed the mixture directly into ungreased mini muffin pans. After placing filled pans in the freezer for 10 minutes the cookies popped right out. This looks like a nice idea for Easter dinner desert for the children. Can you use chocolate almond bark?? It says 1/2 peanut butter. Does that mean 1/2 cup? What size bag of chow mein noodles do you use? Well bummer. Your recipe doesn't say what size of bag of chow mein noodles to use and mine was obviously too small. It was 6 oz and I saw larger bags at the store (but these were in my pantry). So my nests got too gloppy. I'm sure they'll still taste good but they don't look as nice :(((( I did use the ungreased muffin tin and it worked well. I really couldn't figure out why you would grease the muffin tin then put plastic wrap on top?? What good would greasing the pan do? What am I missing? Cute idea though! Glad I tried them and will know better next time! need two amounts- 1st how much peanut butter (1/2 cup or a 1/2 of jar, 2nd how many ounces of chow mein? I was not able to find a bag but did find a can being a large one or a small one? Use marshmallows or just use butterscotch morsels instead. 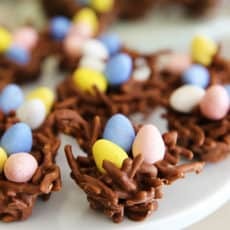 What a fun way to make haystacks for easter! My mom uses butterscotch chips with chocolate chips rather than peanut butter. Whatever is in the cabinet. DEEEEELISH! 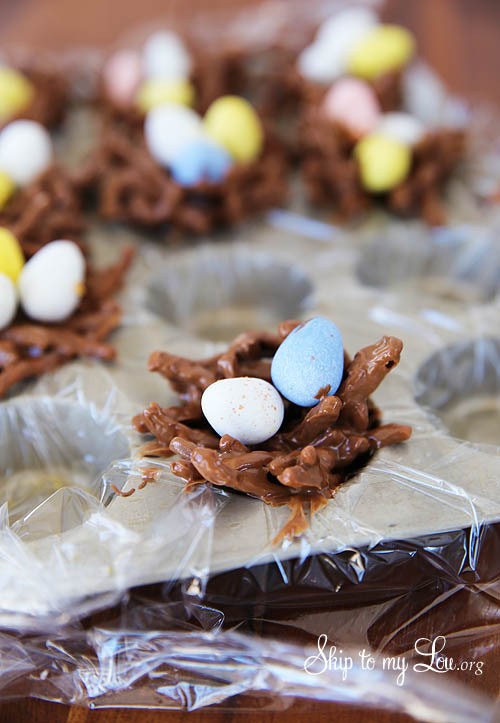 A must make for Easter... or just today cuz the look so yummy! (means uncooked). Are you using cooked ones? If not then when and how are they cooked in your recipe? These are adorable and just so easy! I wonder if I could make these without peanut butter? Has anyone tried it? Here is an easy recipe I shared without peanut butter, hope it helps! these are so cute! 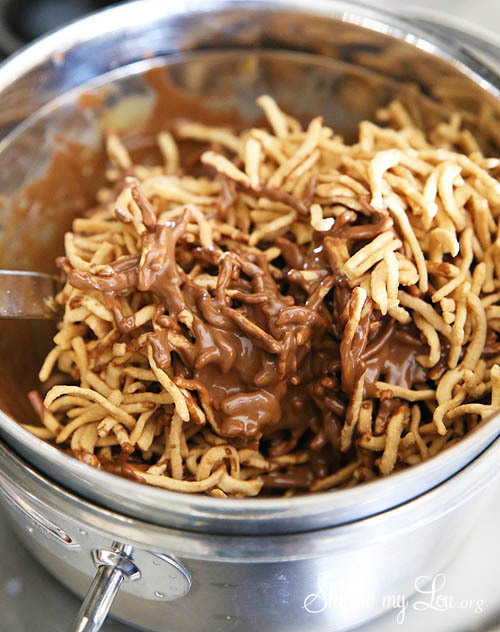 could you make them with mini pretzel sticks instead of chow main noodles? I am sure you could, just need to find a way to make them stick together! Always looking for another reason to buy more Cadbury eggs!! So cute. You had me at peanut butter. Going to make these with my kids, they're so cute! Thank you for sharing this. I just made them with my kids, and it was so fun. I am teaching birds next week in preschool and this will be the perfect treat. Wow, these look absolutely amazing.